It's July and a great time for a beach painting, don't you think? 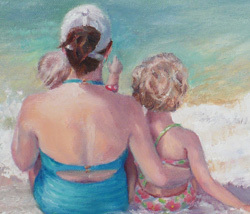 I had a request for a small oil painting of a mother and her two children looking out at the ocean as the waves crash into shore. The client provided three photos of the subject and asked that I use them however I like. One of the photos made a perfect composition, but it was taken at an angle from above. So I changed the perspective to be closer to the same level as the figures. I like to begin by sketching the composition on the canvas first and then paint from the top down. There is no sky in this piece since we are still looking somewhat down at the water, so using a large flat brush, I begin with the lovely turquoise blue ocean. This is a fun part - big strokes. Now back to the little girl. I paint her blond hair using the same colors as used for the sand and water. It's important to maintain color consistency throughout a painting, so I stick with a palette of limited color and use that to mix whatever colors I need. Ah, refreshing! It's a hot, humid day today. A day at the beach like this would be just the thing!